The steps show you how to take the picture using autofocusing. To focus manually, ignore the autofocusing instructions. Autofocusing information presented here assumes that you’re using the viewfinder. You use a different autofocusing technique in Live View mode. Set the Mode dial to Auto or Auto Flash Off. Set the focusing method, Release mode, and other basic settings as outlined in the preceding section. Looking through the viewfinder, compose the shot so that your subject is within the autofocus brackets, labeled in the figure. The camera’s autofocusing points are scattered throughout the area indicated by the brackets. Press and hold the shutter button halfway down. Exposure metering begins. 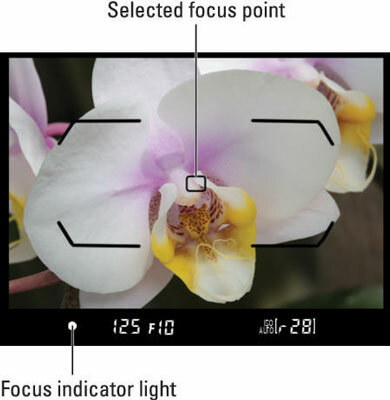 The autoexposure meter analyzes the light and selects initial aperture (f-stop) and shutter speed settings, which are two critical exposure controls. These two settings appear in the viewfinder; here, the shutter speed is 1/125 second, and the f-stop is f/10. The autoexposure meter continues monitoring the light up to the time you take the picture, however, so the f-stop and shutter speed values may change if the lighting conditions change. The shots-remaining area of the viewfinder also changes from showing you how many more pictures can fit on your memory card to how many can fit in the camera’s buffer — 28 here. This number is critical only when you’re shooting a burst of images using the Continuous High or Continuous Low Release mode options, so don’t worry about it for single-frame shooting. In Auto exposure mode, the built-in flash pops up if the camera thinks additional light is needed. You can set the Flash mode to auto (normal) or red-eye reduction mode. Or you can disable the flash by changing the Flash mode to Off. The camera’s autofocus system begins to do its thing. In dim light, the AF-assist lamp on the front of the camera shoots out a beam of light to help the camera find its focusing target. Check the focus indicators in the viewfinder. When the camera has established focus, one or more little rectangles within the focus brackets flash red for a split second. Those rectangles represent the focus points. Then just a single black focus point remains to show you the final focusing area selected by the camera. For example, the camera selected the center focus point. 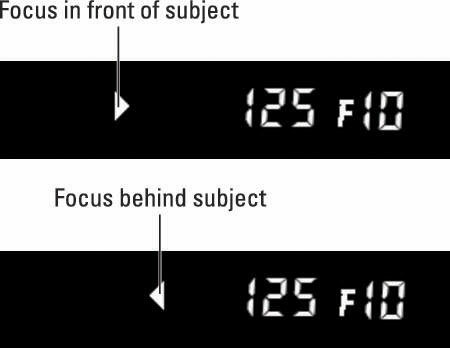 In the display at the bottom of the viewfinder, the round focus indicator, labeled in the figure, lights to give you further notice that focus has been achieved. A triangle to the right or left of the spot where the focus dot should appear means that focus isn’t yet spot on. If the triangle is pointing right, as shown in the top image, focus is set in front of the subject; if the triangle is points left, focus is set behind the subject. And if both triangles blink, the autofocus system is stymied, so switch to manual focusing or release the shutter button and press halfway again to try refocusing. Press the shutter button the rest of the way down to record the image. Exposure: In dim lighting, the camera may need to use a very high ISO setting or very slow shutter speed when the flash is disabled. Unfortunately, a high ISO can create noise, a defect that makes your picture look grainy. And a slow shutter speed can produce blur if either the camera or subject moves during the exposure. If you spot either problem, enable flash or add some other light source. AF-area mode: The Auto Area option is selected, which means that the camera selects which autofocus point to use when establishing focus. 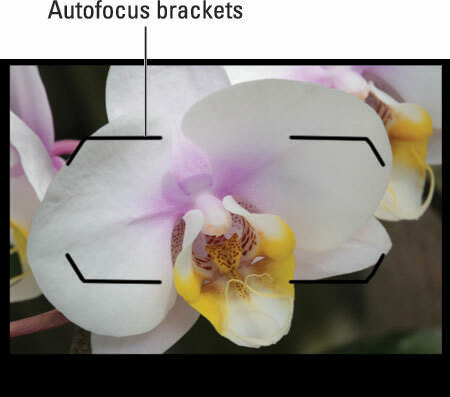 Autofocus mode: The default setting is AF-A, which stands for auto-servo autofocus. If the subject isn’t moving, focus remains locked as long as you hold the shutter button halfway down. If the camera detects motion, it continually adjusts focus up to the time you press the button fully to record the picture. (In this situation, the focus indicator light may blink on and off as the camera adjusts focus.) To ensure that focus is correct, you must keep your subject within the area of the viewfinder covered by the focusing brackets. You can adjust both settings in the Auto and Auto Flash Off modes.